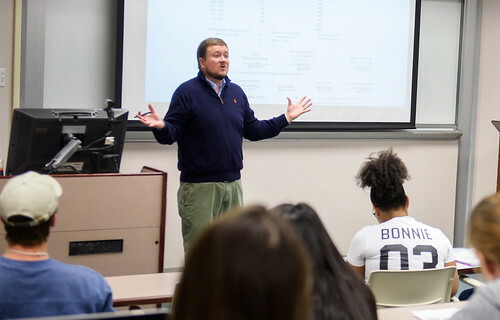 Auburn University faculty member James Long hopes to absorb new teaching methodologies and enhance his ability to present technical material to students from diverse, international backgrounds. As a Fulbright Scholar, he'll get his chance. The associate professor in the Raymond J. Harbert College of Business' School of Accountancy recently earned a Fulbright Scholarship and will teach financial valuation as a visiting scholar at Corvinus University in Budapest, Hungary, in spring 2017. This gives Long the opportunity to collaborate with international faculty, offer his expertise to the Hungarian business community, gain a better understanding of accounting issues and trends overseas, and bring back fresh ideas that can be implemented in the classrooms at Harbert College. "I will be interested in seeing what their presentation strategies are," said Long, who hopes to get involved in a series of teaching-related workshops in Hungary. "From my perspective, it will be interesting to see how they set up the classroom, how they present material. Is it pure lecture? Is it a lot more interactive? I'm excited to get their take on the best way to approach business education and also share our ideas with them." Long becomes Harbert College's third Fulbright recipient since 2010. Danny Butler, the Thomas Walter Center Professor in marketing, taught in Croatia in 2013, while Chris Shook, the Russell Professor in management, received a Senior Fulbright Specialist Grant to teach in Romania in 2013. Since its establishment in 1946 under legislation introduced by the late U.S. Senator J. William Fulbright of Arkansas, the Fulbright Program offers research, study and teaching opportunities worldwide and has enabled thousands of educators across the globe to exchange ideas in and out of the classroom. The program will allow Long, who came to Auburn in 2009 after earning a doctorate at Virginia Tech, to establish a stronger foundation for his future endeavors related to international educational exchanges, he said. Long, a graduate of the Auburn School of Accountancy's Master of Accountancy, or MAcc, program in 2002, cited part of Harbert College's mission statement, which states that the college is "committed to preparing students to compete in the global economy." "One way in which the faculty can facilitate students' understanding of, and preparation to compete in the global economy is to bring their own experiences into the classroom," he said. Hungary drew Long's interest as its economy has evolved from communism, to a mix of communism and capitalism, to capitalism. "It will be very interesting to exchange economic perspectives since they have experienced three different economic regimes over the last 30 years," he said. "I am really intrigued about how they see the world and do business." Long noted that many Corvinus University students "will be very interested in working abroad, or working for American companies" and hopes that he can help facilitate opportunities for them to study and work in the U.S. But Long isn't going just to teach and learn about new classroom perspectives. He is also interested in finding colleagues to collaborate with on new research projects at Corvinus' financial research laboratory, and getting involved in the local business community, which includes PricewaterhouseCoopers, among other U.S. companies. "I'd like to get involved with those organizations, go to some of their events and see what the hot issues are in practice," he said. Long also plans to be active in Corvinus' American Corners Program, which organizes American-themed events for Hungarians who are interested in learning more about U.S. culture. "I'm going to get the opportunity to give some lectures there," he added. "I thought I would introduce them to college football. "They're all going to be singing 'War Eagle' before I'm done." 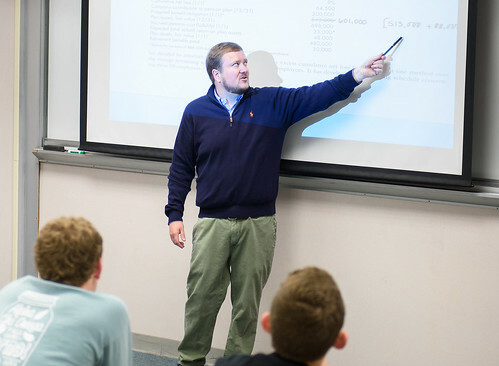 James Long, associate professor in the Raymond J. Harbert College of Business’ School of Accountancy, recently earned a Fulbright Scholarship and will teach financial valuation as a visiting scholar at Corvinus University in Budapest, Hungary, in spring 2017.